When I entered my MAC store to check out the Mac is Beauty collection and saw so many colourful Fluidlines together, I confess that I went a bit mad! 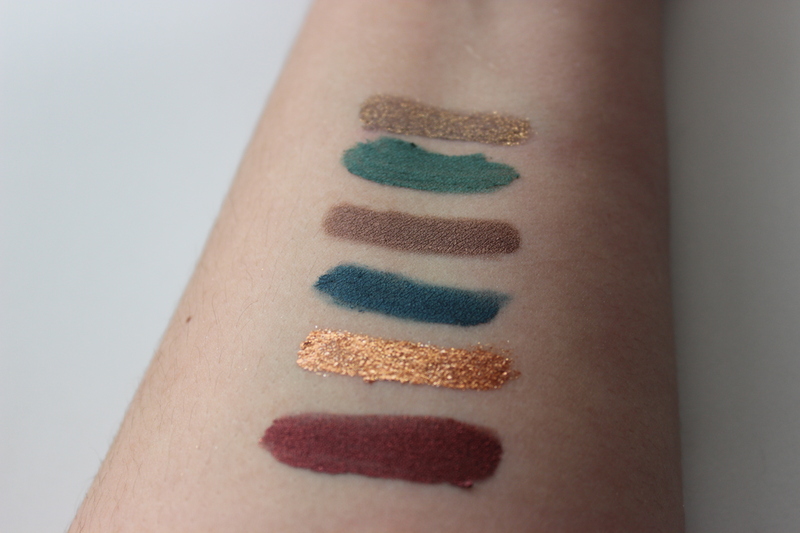 It was a difficult process, but after swatching them I left the store with the 5 shades that I liked most or that were most unusual considering what I already own. Below I have added Deliciously Rich which I first blogged about here. Looking good is very beautiful blackened burgundy with fine shimmer. This is the kind of shade that makes me want to rock a smoky look and the attitude to match. Coperthorn is a very particular fluidline. It has a very sheer orangey copper base with big gold and copper glitter. It is the one that is trickiest to work with, but with a bit of patience you will obtain an almost wet effect. Siahi is a deep petrol blue with a hint of shimmer in it. 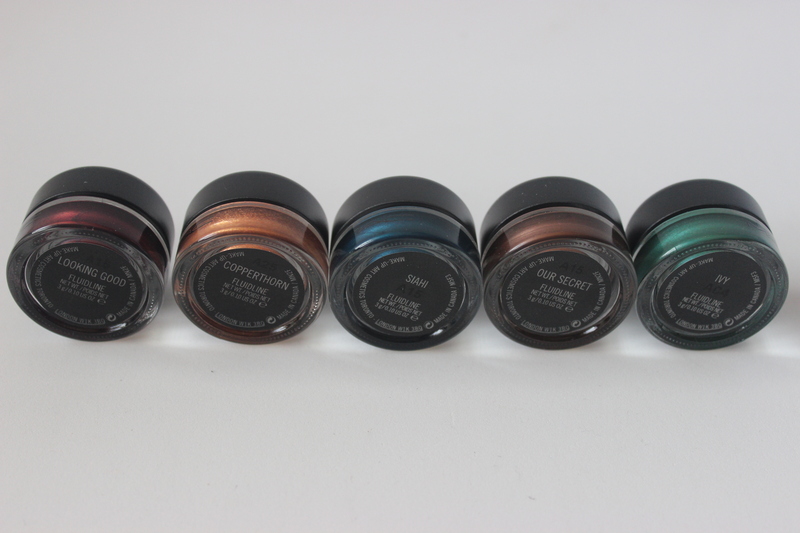 It can easily be used as an eyeshadow base as, as you can see on the swatches, you can blend and sheer out the edges. Our secret is a midtone brown that leans brown. This is a basic and as my old brown eyeliner is drying out, this was the perfect replacement. This shade has great pigmentation. Ivy is a gorgeous emerald shimmery green. As you can see in the swatches photographs, it can be a bit sheer if you blend it out. Deliciously rich is another of the sheer fluidlines. I was told that this was made on purpose so as to provide different textures to use as both liners and eyeshadow bases. In this case it is a beautiful brown that leans aubergine and has golden shimmer. I have Siahi and I freakin’ ADORE it 🙂 I’ve been wearing it a lot lately. I tried a smoky eye with siahi (crazy I know!) and it didn’t look that bad. But then again, I seem to be going through a blue phase! I live everything blue!! I know, right? We obviously have proof that a similar situation occurred with me and I had no will power at all! Deliciously Rich is now on my wishlist (resist-list?) for MAC. 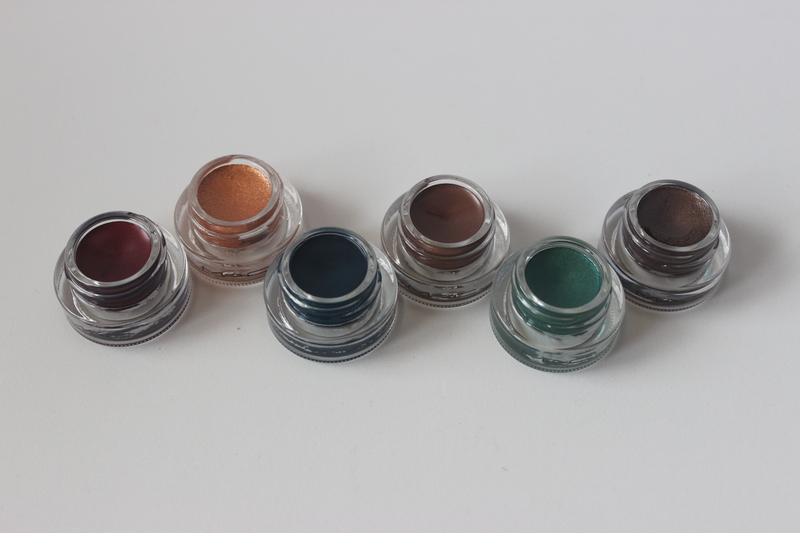 It is absolutely stunning and would be a versatile lid/liner shade. I really wanted Ivy for a bit but convinced myself to pass because it was a color I wouldn’t wear frequently enough. I love nearly every single fluidline that you have–the only one I’m not head over heals for is Copperthorn since glitter isn’t my favorite on the eyes. I’d be really interested to see how Looking Good as a base would pair with Lorac’s Garnet on top. Thank you! I was really tempted to pick up another blue as they were so pretty but I had to use some commone sense: I don’t use blue that often!